Over the summer my love for yoga blossomed. I had maybe taken one yoga class before March of this year, when on a whim I decided I wanted to join a yoga studio up the street. It’s about a 5 minute drive up the road, or a 10 minute run. They had a new member special for one month and I decided to buy it over spring break. At the time I was thinking about the future, and how i wanted to zen my way through wedding planning and be totally blissed out by the time the wedding day came around. I’d like to this this helped a little, seeing as how I was miraculously calm on the actual day and day before it. I knew I would have two weeks off at spring break, so I could go to the early morning classes. And, since it was a month unlimited I took as many classes as I could. I tried all of them, but really love flow, alignment flow, and power and strength classes. The yin and restore classes, or the ‘seated position’ classes where you hold a pose for 3-5 minutes are too slow for my liking. I can hardly get through holding some of the poses without thinking ‘omg, omg, omg’ in my head before finally being able to let go of the pose. Seriously – how long is three breaths??? I swear I can take 3 breaths quicker than others, because when they say ‘and hold for three more breaths’ I’m like annnnnnd done – except its like a whole other minute longer. oops. Some days I can zen out way longer than others, by the time savasana is over i have almost fallen asleep. And now, I love moving through vinyasa’s. downward dog is my friend some days, and others i swear i can’t hold any longer, but somehow make it until we go through a vinyasa. Over the summer i bought the unlimited summer membership and again, could go to the early classes. After the wedding I bought a 10 class pass and I’ve made my way through it over the last month. Although since I’m back at work I don’t get to go to all the morning classes I love, but when I do have a morning off I’ll be sure to go to my favourite class. I like to think that yoga and baking are my relaxation techniques. 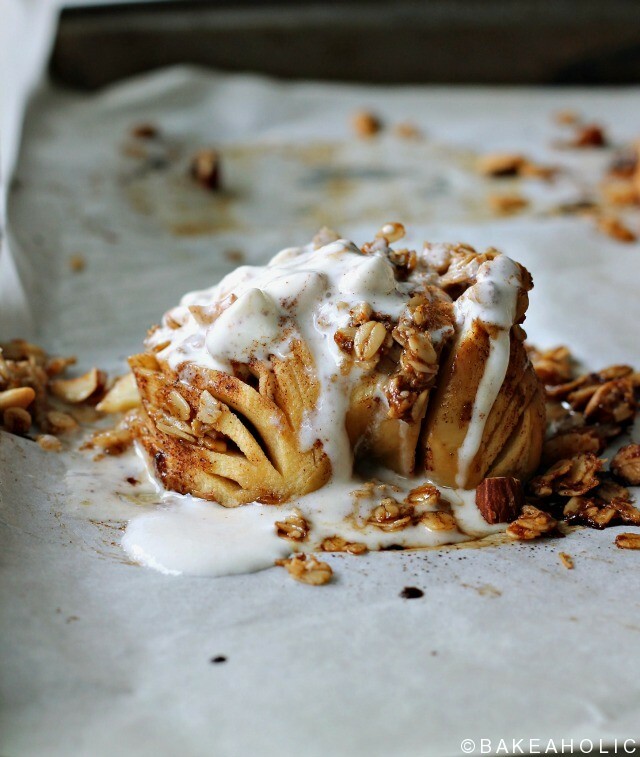 I can zen out on the mat, but also in the kitchen – and these little beauties will most certainly be making their way into our regular fall dessert routine – post yoga. 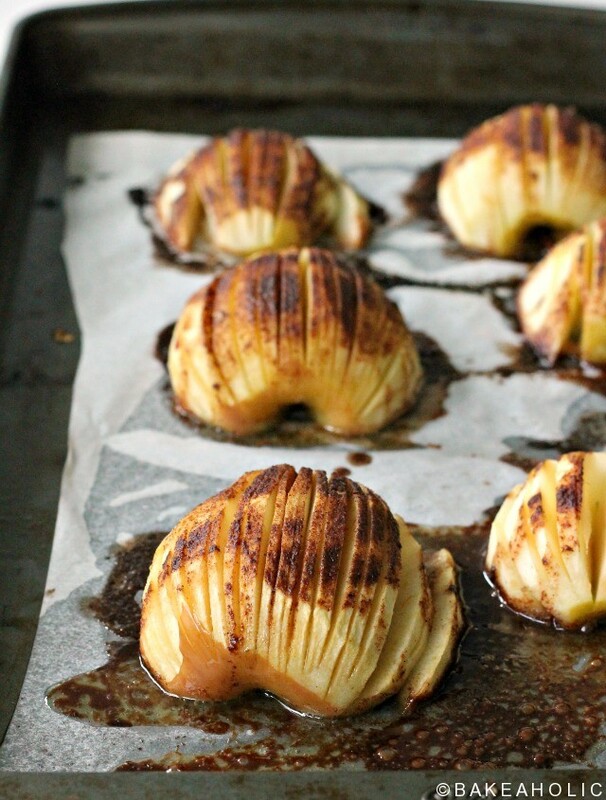 Having made hasselback potatoes before, I’m not sure why I haven’t used this technique in more recipes. 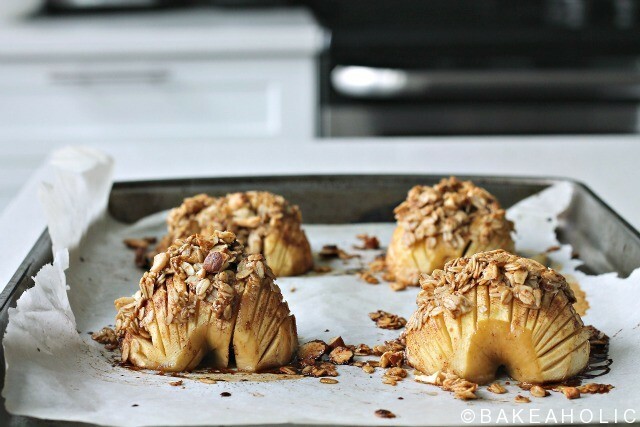 I had seen hasselback apples online before on pinterest, and on instagram, and I’m not sure why it took so long to try them. They’re simple, few ingredients, and taste quintessentially like fall. 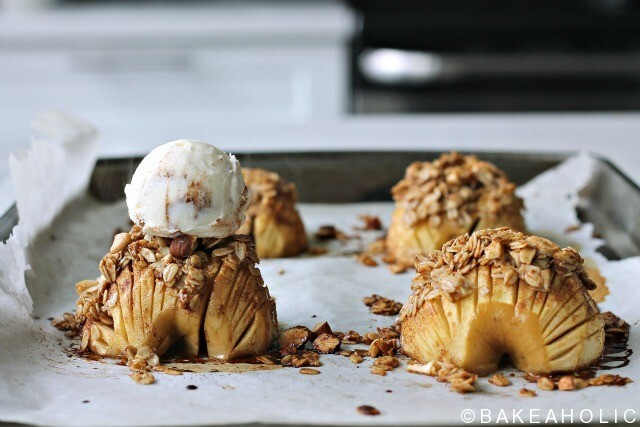 It’s like a personal apple pie, without the buttery crust. These are perfect for dinner parties since you can prepare them beforehand, and finish them after eating, and they’re simple enough that you can make them for a crowd. 2. Take the peeled and cored apple, and cut most of the way through (not all the way though) each apple half in thin slices. 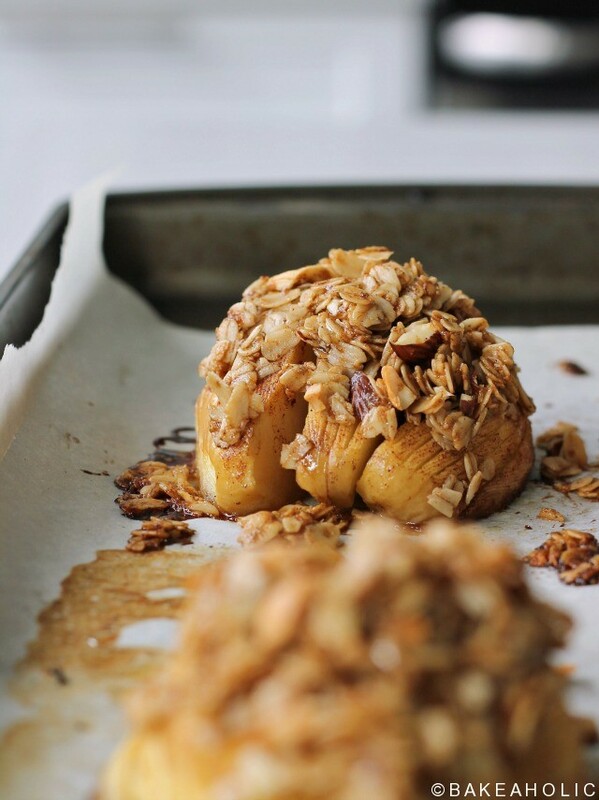 Place apple halves, cut sides down on a baking sheet with parchment paper. 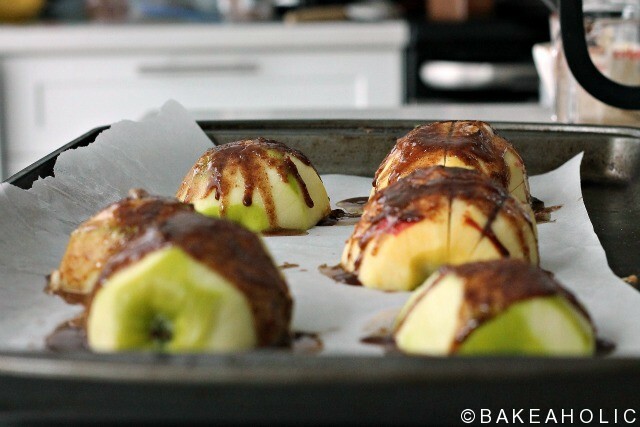 Combine the butter or coconut oil, cinnamon and sugar for the apples together. Brush or spoon mixture evenly over apples. 3. Cover pan with foil; bake at 375° for 20 minutes. Remove foil. 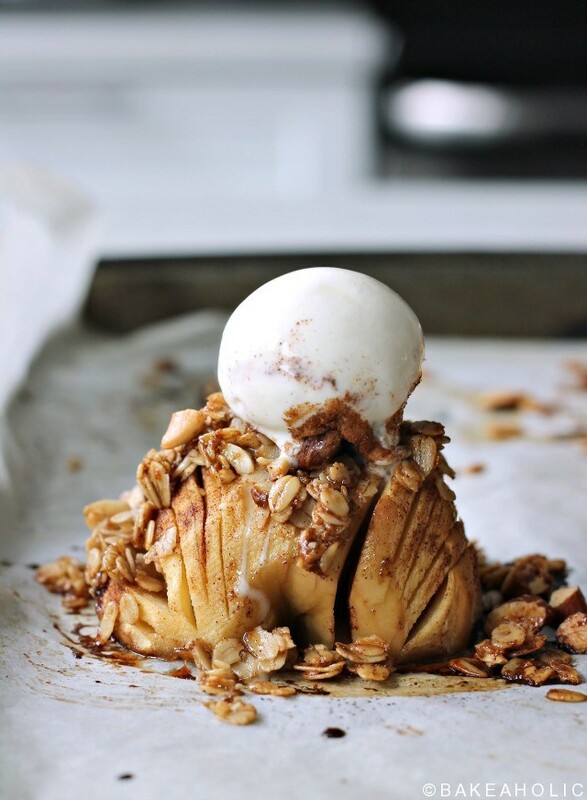 Bake at 375° for 10 minutes or until apples are tender. Remove from oven. At this point, you can leave the apples for later before moving on to the next step. Turn off the oven until you are ready to bake again. You can prepare the apples this far until you are ready to eat. 4. Combine remaining crumble topping mixture - coconut sugar, rolled oats, cinnamon and coconut oil or butter in small bowl. Spoon oat mixture evenly over apples, trying to get it into the crevices of the slices. Bake at 375° for 10 minutes. Turn broiler to high and broil 1-2 minutes. 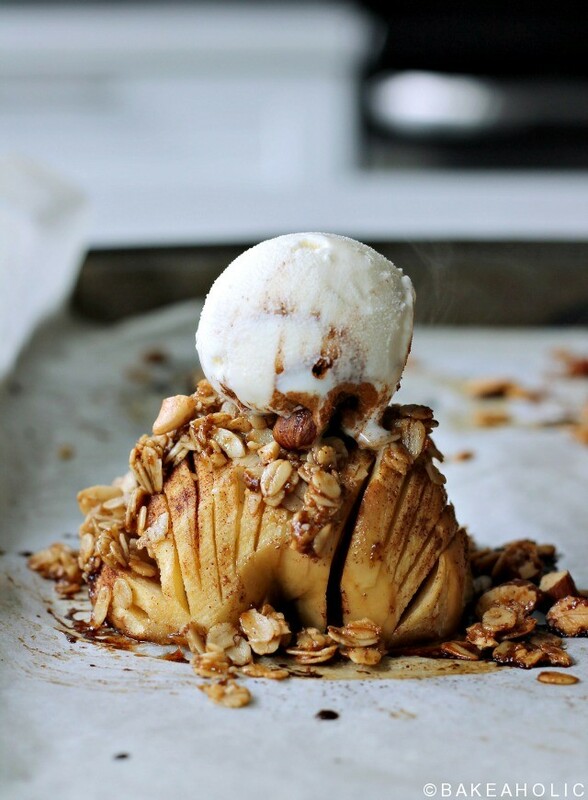 Serve with non-dairy ice cream. You can make this recipe for any number of guests, by adding more apples and adding to the crumble topping. I like to add walnuts to the crumble, but you can leave this out if there are any allergies.